Big Shark Poster: Can Tommy Wiseau Save New Orleans from This Great White? We were treated to the Big Shark teaser over the weekend and now we have the first poster from Tommy Wiseau's upcoming horror movie. As with anything that Wiseau does, everything is pretty weird about the teaser and the poster, which is obviously part of the charm for the project. The Room director announced at a Q&A screening in Germany that he was making a shark-attack horror thriller and that it also features his old buddy and co-star Greg Sestero. 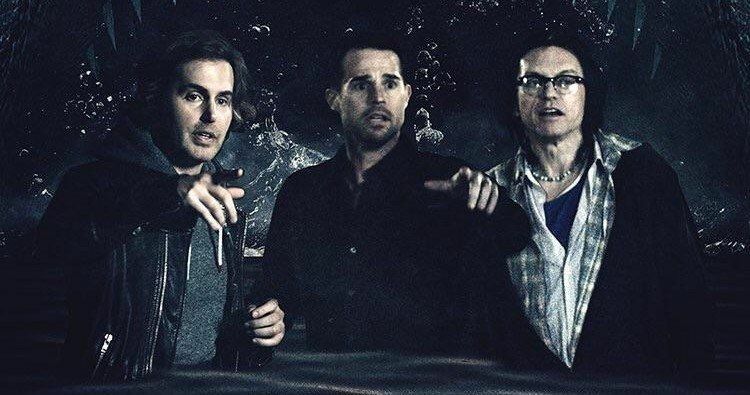 The Big Shark poster features a still image from the trailer of Greg Sestero and Isaiah LaBorde pointing at something off in the distance while Tommy Wiseau looks amused. Out of the three of them, LaBorde is the only one who seems like he has actually seen a giant man eating shark. Behind the actors is an image of a giant shark, like The Meg coming out of the water with blood in its teeth, which is more than likely from the woman that it devoured in the trailer. Upon closer inspection, there are some other interesting facts about the Big Shark poster. The title has the copyright symbol attached at the end, which really isn't needed, but Tommy Wiseau isn't taking any chances, though he probably wanted to use the trademark symbol. And then there's the fact that it has Wiseau's name on the poster and then below it says: "From Creator of The Room," when that text should be above the director's name. These mistakes may actually be intentional to keep with the Wiseau tone, or the man may actually be just like he comes off and doesn't let anyone interfere with his creative process. There is no release date set for Big Shark yet, but Tommy Wiseau expects to have the movie out by September of this year, which means that it's time to get started filming in New Orleans, which is where the movie takes place. Wiseau chose the area because he enjoys it and he wanted to give back to the community, which means that he's going to save the world from a giant evil shark. As far as the plot is concerned, we only know that it takes place in New Orleans and that Wiseau is going to be the hero. Since The Room has become an iconic cult film over the years, there might be some pretty interesting cameos in Big Shark. The 2003 movie received even more attention in 2017 when James Franco and his brother Dave Franco brought Greg Sestero's book about working with Wiseau to life in The Disaster Artist. It's going to be interesting to see how this all works out for Wiseau and his new-found popularity in Hollywood. One can easily imagine a ton of A-list cameos just to be included in Big Shark for some fun. We'll just have to wait and see what Wiseau cooked up this time. You can check out the poster for the movie below, thanks to Big Shark.